How to make the most of unwanted Christmas packaging for the benefit of your pets! We all love receiving presents at Christmas, including our pets, and just imagine how much waste we could reduce if this year everyone recycled or re-used the packaging our gifts came in. The amount discarded after the Christmas period is extraordinary but as those with cats will tell you, it is often the packaging (rather than what’s inside!) that provides the most fun and games. Present packaging is not the only type that gets thrown away after Christmas and festive indulgence means lots of food cartons and drinks bottles make their way into the dustbin. Just imagine what fun you and your pets could have finding unique ways to put this redundant packaging to good use! Whether you have cats, dogs, small animals or birds, everyday boxes, tubes, tins and bottles can be re-fashioned into entertainment for your animals, or a practical storage solution for your home. They also offer a money-saving gift idea that your pets are likely to appreciate just as much as an expensive new coat, stroller or squeaky toy. 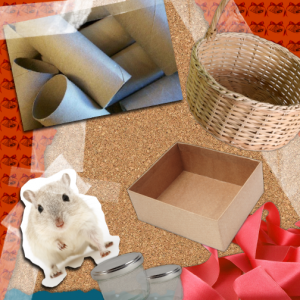 Cardboard toilet roll tubes are a very versatile item that can double-up as tunnels or a fun maze for small animals such as hamsters and mice. By attaching these tubes together, whether horizontally or vertically, you have an immediate recreation system for your animals to clamber through and enjoy. Cardboard tubes are easy to decorate and can be fixed together with sticky tape, so constructing a Christmas maze couldn’t be simpler! They also make great storage tubes for small toys and treats when both ends are covered. Perhaps one of the biggest wastes over Christmas is all the discarded wrapping paper that bulks out the bin and, because most festive papers are covered in foil or plastic, can't normally be recycled. However for pet owners, there are a variety of ways to re-use this paper. Shredding it into narrow strips, for instance, makes great insulating bedding for small animals to rummage around in and keep warm. Most of us animal lovers will know how much cats love a good box. No matter the size, cats will take full advantage of having a cosy cardboard space to nestle in, meaning the gift inside the packaging is often forgotten about. This year, give your cats and kittens a present truly guaranteed to please – a regular cardboard box with a soft cushioning inside. Even better, build a customised tower or fortress for your cat using different-sized boxes, cutting out doors and openings for your feline to climb through and placing treats, toys and bedding along the way for an exciting and interactive adventure! Teasers can also be fashioned easily and with very few materials. Attaching a colourful ribbon or piece of string to a lollipop stick or plastic straw, with a small bell, feather or strip of fabric at the other end will provide hours of fun for your cat, whilst making use of odds-and-ends that would otherwise be thrown away. You can also make your own scratching posts by winding rough twine around cardboard toilet roll tubes and attaching them together. If you have guests this Christmas that are going to be bringing their dog, make up a snug bed for the visiting canine with a drawer taken from your chest of drawers. Clear the drawer of all your clothes and fill it with a warm, plump lining for the dog to cosy up in, making sure any rough wooden edges are covered. Smaller dogs and cats may prefer a drawer from your bedside chest that will keep them comfortable and secure. All those empty jars and tins piling up after Christmas can also be re-used for storing your pet’s treats and medication. Arranging them together on a shelf, clearly labelled, will give a practical and unique look to your home, whilst making you feel good about finding new uses for everyday packaging items. Plastic bottles are also extremely versatile and can either be recycled or re-used, doubling-up as roll-able treat dispensers or wild bird feeders. Placing treats inside a plastic bottle (make sure these are not too small as they will come out very easily) and removing the cap (or make sure the cap is securely fastened and nail a hole through it for an opening), will make a great toy or boredom breaker for cats and dogs that will roll it around waiting for the next treat to fall out. Plastic bottles can also be filled with bird seed and hung from a post or tree in the garden to provide nourishment for wild birds through the harsh winter months. Secure the cap with the bottle upright and make two small holes on one side of the bottle (one towards the top and another towards the middle or bottom). Make two corresponding holes on the other side of the bottle so that the holes line up, before getting two wooden spoons and pushing the stalk through the holes (with the spoon itself facing up), so that it appears on the other side. This will provide a good platform for birds to perch on while they try and extract seed spilling through the holes. Festive hampers or baskets can be remodelled after Christmas into pet habitats by cutting an arched doorway into the side and turning it upside-down. These are great for indoor and outdoor rabbits, guinea pigs and cats. Egg boxes also make ideal feeders for very small creatures such as hamsters and mice. Simply cut out each cardboard egg slot and fill with tasty treats to put in your pet’s cage or enclosure. If you have multiple hamsters and mice, leaving the egg box intact will provide a great multi-feeder that ensures all your animals get a look in at mealtimes! Lastly, any squeezable tubes that are left lying around can be cleaned out and re-filled with water to take with you when you and your dog are next on-the-go. Muddy paws can be problematic after winter walks, so having easy-dispense water to hand can help clean up mess and rid boots and hands of surface dirt. This Christmas, while you and your pets are enjoying opening your presents, spare a thought for how all that unwanted packaging can be re-used into fun and practical items for your animals and your home! Be wary of anything that might pose a threat to your pets, and make sure you clean all items first before re-using them. If you have any further tips on making the most of packaging for your pets, please share them with us! Keep wrapping paper away from bunnies! Not good at all if they eat it.